Halloween themed stationary by Ciel. I love the zany, Halloween style, what with the pile of humongous Jack-o-Lantern Pumpkins; the twilight sky with the crooked spires and roofs crazily tilted and angled, silhouetted against the fading sunset; the poison green vines crawling up Allen; and of course, those fab Dracula outfits! Love the reds and blacks, with the pinstripe ties. Allen's wearing his trademark red ribbon still, eh. 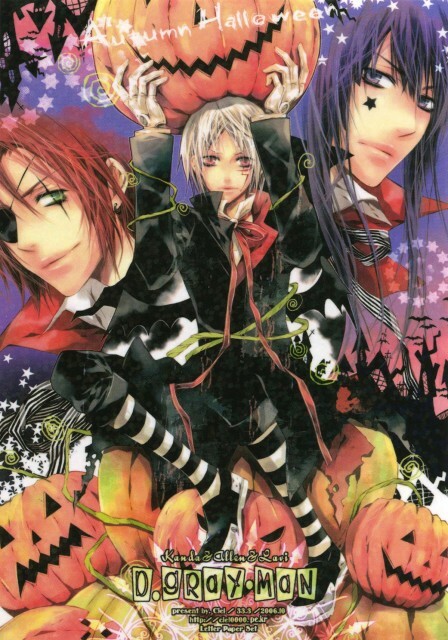 And now, Lavi and Kanda have 'marks' too. *points at the black 'scar' and pentacle* The blend of textures veers on the crazy, messy side but Ciel pulls it off so well..
Yummy picture! Hard to believe that it's only for a letter paper set... If only stationary looked this cool here. :D Tell me more about Ciel, he/she isn't listed here..
One word. Gorgeous!..It was really you who did Allen who was holding the rose?Felcie said so..It was really beautiful!.This one too! Great ! Never seen this before! Thank you for such beautiful scan, I really like this. Ciel's Artwork is as beautiful as always! I love this ^^ thanks for sharing!